What happens when you have a number of sublimely talented musicians rubbing shoulders together on a disc? If the programme is satisfying chances are the disc can be rather good. To make that good record great you must have great arrangements that don’t simply exploit the textures and timbres of reeds, brass and woodwinds, but redefine the sound of these instruments. And there is also this: the arrangements ought to be written around individual musicians whose work is rooted in their local musical cultures, absorbed to form highly personal styles. 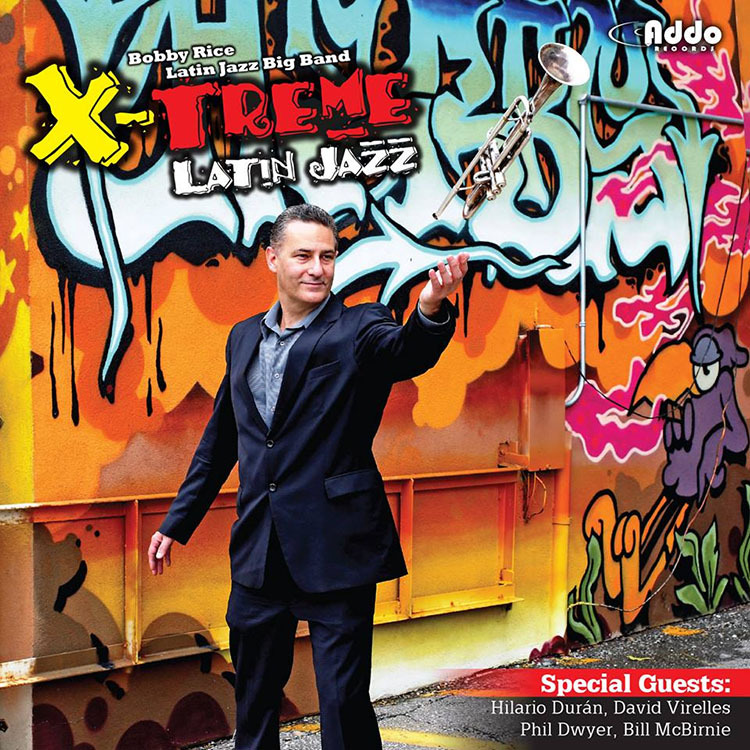 While this is not always the case on X-Treme Latin Jazz, you simply cannot expect anything less from pianists Hilario Durán, David Virelles, drummer Mark Kelso, bassist Paco Luviano, percussionist Luis Orbegoso, and the flutist Bill McBirnie and saxophonist Phil Dwyer without getting a very special sound. Not that the other musicians on this date do not make wonderful contributions as well, but the ingenuity of those musicians make all the difference on this record. Of course, Bobby Rice is no slouch either; not with the trumpet and not as a writer as well. His tone is rich and his sound sears the auditory faculties, and together with his band and the stellar cast rhythm section Mr. Rice has created a near perfect record. Clearly the bandleader has made a great effort to enter the expressive world of the compositions. This is something shared by the rest of the band as well. Their performances show not only a high level of technical assurance but an intuitive reading of the material as well. A wealth of tone colours emerge within the restrained, delicate ambience of the pieces and this rises in intensity until the music reaches a passionate outburst near the end of each piece which is highly desirable. The horns are particularly brazen. In any big band these musicians create the shape and put a halo of sound around the performances of the rest of the band. On this album, Hilario Durán and David Virelles also do just this. Perhaps the devastating genius of these two musicians; their frontal attack and tumbao—charts such as “Yesterdays” and “This Masquerade” come to mind—makes for the character of the pieces and their performances thereof. Mr. Durán, Mr. Virelles and Mark Kelso join forces with Luis Orbegoso as well to emphasise the bustling qualities of the programme. Mention must also be made of Bobby Rice. The trumpeter has a gift for big band writing, which is why this record is among the standout productions by a big band. Mr. Rice is also generous in the manner in which he distributes the largesse of his writing, making sure that all of the talent on this record has a say in the proceedings. And because the trumpeter and bandleader has chosen his subjects well the overall standard of the record has been raised considerably. The performances of the two Cuban-born pianists cannot be rated highly enough though. Their playing is always thoughtful and imaginative and casts an individual light on this complex and absorbing body of work. Track List: Yesterdays; Canadian Chá-Chá-Chá; Winter Blooms; Chá-Chá for Christina; Camilo’s Way; Delphine; This Masquerade; Transition; Fais Do-Do. Personnel: Bobby Rice: trumpet; Sundar Viswanathan: saxophone; Coleen Allen: saxophone, flute (5, 9); Jeff King: saxophone; Perry White: saxophone; Pol Cousseé: saxophone; Alex Dean: saxophone, clarinet (6); Vern Dorge: flute (6); Phil Dwyer: saxophone (4, 8); Al Kay: trombone; Kelsley Grant: trombone; Chris Butcher: trombone; Peter Hysen: trombone; Gord Myers: trombone; Nick LaRiviere: trombone (9); Jason Logue: trumpet; Sandy Barter: trumpet; Kevin Turcotte: trumpet; Jon Challoner: trumpet; Brian O’Kane: trumpet; Hilario Durán: piano; David Virelles: piano; Jeremy Ledbetter: piano ( 3); Paco Luviano: bass; Ted Quinlan: guitar; Mark Kelso: drums, timbales; Luis Orbegoso: congas, bongos, bells, guïro, Brasilian percussion; tambourine.